Unless EU leaders match their responses to what happened in Catalonia with their statements, they will be forever seen as hypocrites when trying to install democratic values in foreign countries, says Matt Carthy, MEP from Ireland. Almost 900 Catalan voters were injured in assaults by police during the Spanish region's independence referendum on Sunday. Madrid deemed the vote illegal, and the Spanish prime minister rejected the results. Despite Spanish government efforts to stop the referendum from going ahead, the Catalonian administration published the results with 90 percent supporting Catalonia's break from Spain. 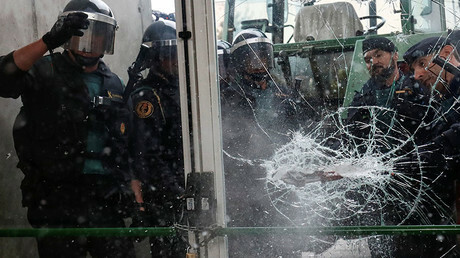 After a day of wide-scale violence and police brutality, deputies from the European Union proposed holding a session over what happened in Catalonia. However, European officials have remained mostly silent, arguing the issue is an internal one for Spain. RT: Spain's prime minister claimed Madrid set an example to the world in its handling of the referendum. But we've seen many scenes of brutality against peaceful protestors. Was it really a good example, in your opinion? Matt Carthy: I would just love it if the Spanish administration would come together collectively and read a history book. Let’s make no mistake about what we all have witnessed: we saw an EU member state government deploying an armed police force to physically and violently prevent people from actually voting. Make no mistake about it. Had this happened in the Middle East or in South America or if this happened in some of the new member states, we would have EU members and leaders lining up with the most vicious words of condemnation. It is not good enough. 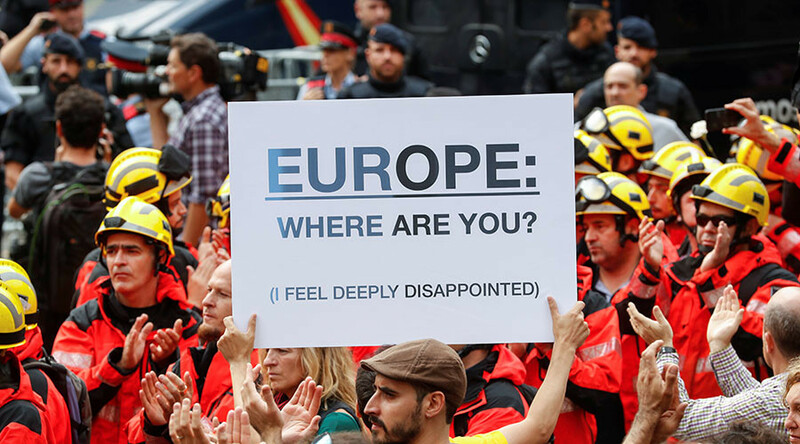 The response from the European Union has been pathetic. It is quite clear to me that democracy took a big hit, but so too in the intervening hours has the credibility of the European Union itself, because this is to my mind a great threat to democracy. But it is also a threat to law and order, to every sense of justice that European people feel and that European leaders preach across the world. And it is happening right in the heart of Europe. A European government has gone to extreme lengths that is more reminiscent of dark past eras gone by. RT: How would you comment on the EU's reaction or rather lack of it? Do you think Brussels would be so quiet if we saw such scenes playing out elsewhere? Shouldn’t top EU officials be held to account for turning a blind eye to all of this? MC: The response of the EU collectively has been pathetic, and including member states and countries who should know better. My own Taoiseach Prime Minister Leo Varadkar from Ireland, someone who comes from a country that battled for its own independence should be to today leading the front, calling for the self-determination and for the very existence of democracy in Catalonia to be upheld and protected. Unfortunately, the best we’ve got from any Europeans leaders is a condemnation of the police violence. Absolutely, that should be the very first thing. But I think now we need to move it to the next level. We need to be saying that you cannot possibly have a situation where somebody says that it will be forever and eternally illegal for a country to determine by democratic and valid means of a referendum to decide its own future. It’s not good enough; it is not something that I can accept. I think it is not something that the vast majority of the European Union citizens can accept. Because right across the world, if this were happening anywhere else, there would be revulsion and the strongest statements possible coming from EU leaders. And unless they match the same type of words and responses to this instance, then they will be forever seen as hypocrites whenever they try to intervene or install democratic values in another part of the world. “The European Union so far is making a huge mistake, because we are not mainly talking right now on whether Catalonia has the right to become an independent state or not. It is up to the Catalans to decide. 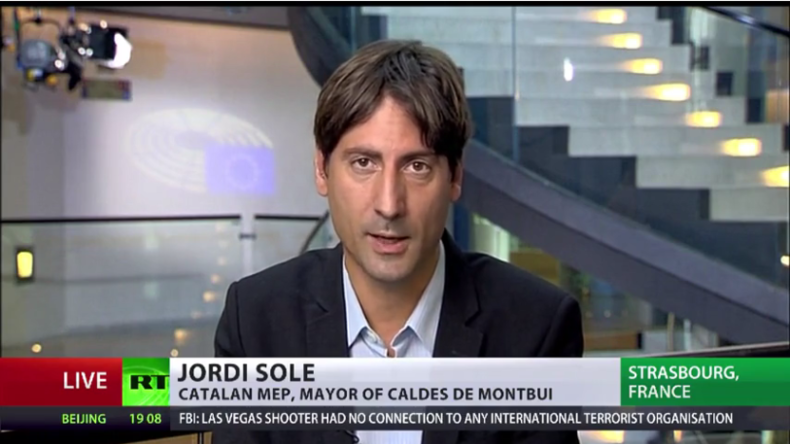 But we are talking about basic fundamental democratic rights being attacked in the European Union, in 2017,”MEP Jordi SOLÉ told RT. “We Catalans are citizens of the European Union. The Charter of Fundamental Rights of the European Union also applies in our country, so the European Union and European institutions should be concerned about what has been going on in Catalonia in recent days. They shouldn’t be only talking about law and constitution, about the rule of law, they should start talking about fundamental democratic rights,” he added. “The Catalan government wants a result, the Catalan government wants an open debate on whether Calatonia should secede from Spain, which is perfectly natural for someone to want. 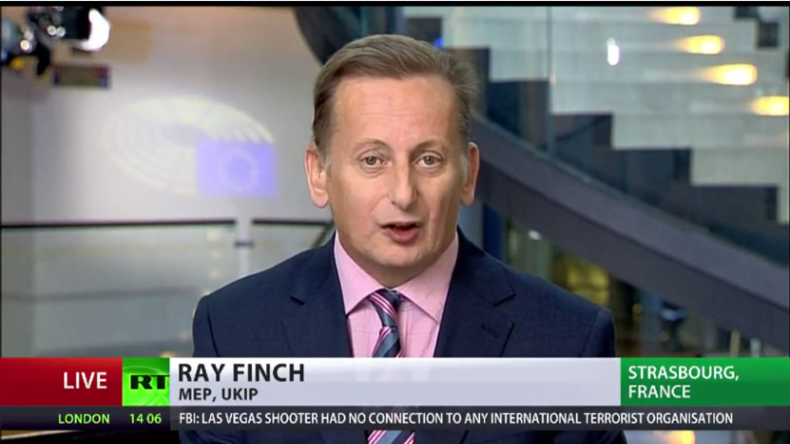 Could you imagine the trouble that the British government would be in, if we had sennt our police to attack Scottish National Party supporters in that way,”Ray Finch, MEP from the UK Independence Party, also commented on this topic.